While the U.S. may have traditionally been the ‘Land of Opportunity’ the world wide web has opened the doors and possibilities up to everyone. Jobs that were once done in an office are now being performed in the far corners of the earth. From virtual assistants in the Philippines, to web developers in rural India. The internet is a Game Changer! It really winds me up when I hear people say ‘Oh I’m stuck in a dead-end job and I just don’t have the same opportunities as you’. It’s time to wake up and realise that you do and that anything is possible! Some of the world’s leading academic institutes have coursework available online, free of charge. While you won’t obtain the degree certificate or qualification, you still have the same opportunities to learn. Some might say that you have an advantage using such material over attending a mediocre university that you have to pay for. With Entrepreneurship at an all time high and the education system in a state of disarray, there has never been a better time to do things yourself and try something new. After all, if you are going to create a tech start-up and do things yourself, what does a degree certificate even mean and what value does it hold? Very little I would imagine. The thing I love about side hustles is that they are on the side. Simple right? The real beauty of a side hustle is that if things go terribly wrong, you still have your main job / career and the security that comes with it. You can learn from the mistakes, move on and start again. Whether your side hustle is a Niche Website, a blog, a service or something else – you can create a website and get going for less than £50! Look at this blog for example. This is not my main source of income, rather a side project; I write when I have time and the site has grown nicely over the last year and a half. When I first started the blog, I had no idea how much money I could make. I remember being excited the first time that I made enough money to cover my costs and now I am dreading the complicated tax return that will have to be submitted this year! All you need is inspiration, motivation and dedication. These things come from within. I like to think of side income as additional income that you wouldn’t have otherwise had. For some this might involve jobs at working mums and others a secondary or tertiary job! One of my friends in Texas had three jobs during the summer holidays which he used to save money for going back to school. I never once heard him complain; he had his priorities and his dreams sorted out and did everything he could to attain them. He is now a very successful engineer earning mega-bucks! When society complain that there are no jobs available, I say go and create a job. Take my earlier example of a virtual assistant in the Philippines; until the concept was dreamed up and became popular a couple of years back, this was a completely alien concept. Now, individuals have jobs thanks to demand from other countries – these jobs are not dependent on the economic state of the home country, but instead take advantage of other booming industries. The Travel blogging community hosts a plethora of nomadic, location-independent writers. People with no ties, who are free to work from anywhere they go. They get bored of one country and move on to the next, earning money through advertising and guest writing as they go. These advertisers are not concerned where about that person lives as the internet is accessible in the same way from almost anywhere! The world is transforming drastically. Desktop and mobile videoconferencing / meetings is slowly removing the need for offices to have the capacity to hold all the staff at a given time. Working remotely is changing the way in which businesses run. We need to embrace this and be a part of it, or we will undoubtedly get left behind. Look at some of the first family-run high-street stores that didn’t embrace new ways – do any of these exist anymore? Probably not! The next time you tell yourself or somebody else that you got a raw deal and can’t find a job or don’t have enough money consider this: Maybe you are not looking in the right places? The internet has definitely levelled the playing field. It doesn’t even take that much capital to set up something that will earn you something. All that one needs is an idea, hardwork and constant learning to keep abreast technologies. Simply put, one is only limited by their imagination (or lack of it), opportunities are everywhere. The wold is changing indeed. I guess I created a little job for myself with blogging as I am finally making money off of it. Would love to make more as I am actively trying. Side hustles are great if you are willing to spend your nights and weekends working on them (and lunch breaks…and early mornings…). I like side hustles that have potential to grow into a small or large business. I have always had several jobs at night and weekends, to help make an early exit out of the corporate world. I love keeping active and having several sources of income limits your risk. I LOVE side hustles! Right now I’m trying to grow my online hustles, but the off-line hustles have been a lot of fun to do and have made me a decent amount of money so far. I think you hit the nail on the head with this one, “I never once heard him complain; he had his priorities and his dreams sorted out and did everything he could to attain them.” People who aren’t afraid to put the work and hours in and know what they want are more willing to do what it takes. Side hustles are a great way to do that. Thanks for this info. You’re right! Side hustles are certainly available if you have the desire and time for them. I love it! Great job on using your website as a side hustle. I recently subscribed and I’m finding lots of great articles, thanks! There is no excuse for not doing what you want to and getting out of life what you want. It just takes guts, networking, hard work and confidence. You have to be willing to go out and do it. Nothing is ever guarantee but i hate when people find excuses for not doing something. Be helpful, learn and act. I’m a huge hustler – I have quite a few side hustles and I don’t foresee ever stopping with them. There is no lack of them, that’s for sure, now that the internet is so profitable. The internet has been a major part of the global change in communications and on how we do work. Having a side income never hurts anybody especially if the job is accessible as it is now thanks to the world wide web. Side hustles are the way forward I think! There’s no reason why we can’t go out there and make money. We just need to be active in doing so and as you say look in the right places! It might not be much at first but everyone has to start somewhere. Wow! You nailed it. I just received an email from someone today asking for money. I had to build radiation walls, move chickens onto trucks to get slaughtered, and clean french fry vats to get my start. There’s always a way to find some income if you want it bad enough. The question is whether you’re going to blame someone else or grab the ball and run with it. This is a great article! When you put hard work into something, whether using your time to save money or by making it, every little bit counts. 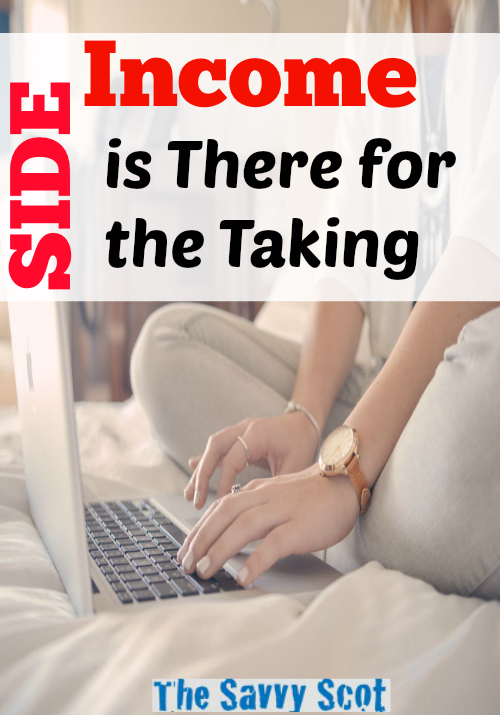 Most people don’t even think about a side job, and boy are they missing out!